Going through the museum’s archives I came across an old photo album featuring a yacht and two men photographed during the 1930s – nothing unexpected for a maritime museum’s collection. Little did I know that I would fall in love with the boat’s story. 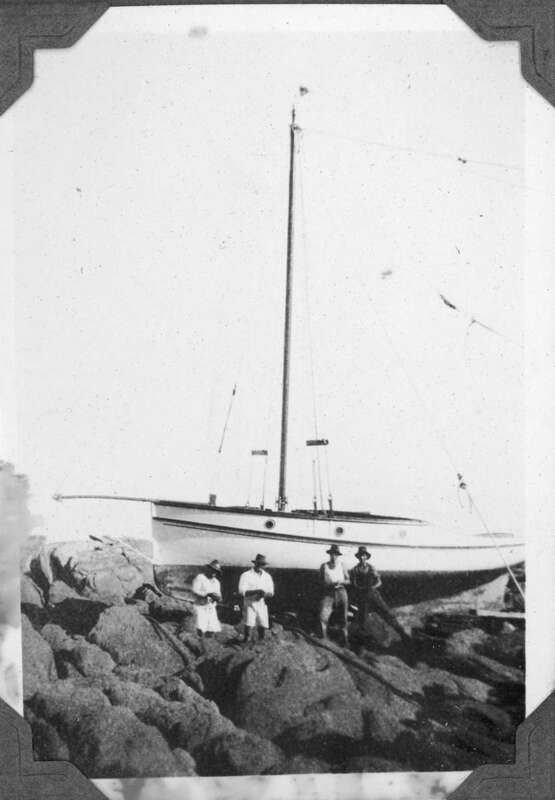 It all started in 1932 when George and William (Willy) Clark (the ‘Lucky Clarks’ as they became known), two brothers from Sydney who were also wealthy foresters, decided to build the 9 metre gaff-rigged cutter Maluka of Kermandie following the design in Huon pine by Cliff Gale. In 1933, the brothers took Maluka on a five month cruise off Far North Queensland, followed by a trip to Lord Howe Island the following year. The album documents these trips with numerous photos of Maluka at sea and the adventurous, care-free life of the brothers, fishing, going for picnics in remote places and mixing with the locals, reinforcing the romantic ideas of escape and private travel that have fascinated people and contributed to the characterisation of cruising sailors as bohemians and eccentrics. By this stage, Maluka had cruised the whole of the east coast of Australia, with the exception of a small portion of the Cape York Peninsula. In December 1935, following some modifications to the cutter, the brothers and crew took her out of Sydney Heads with the hope of spending Christmas in Hobart. At the time, the notoriously rough Bass Strait, was mostly sailed by big cargo vessels and mail and passenger steamers. Only a few daredevils in small vessels, challenged the strong currents and wild waves often experienced in this area. After taking a few breaks in sheltered spots along the way, the crew took Maluka through the Strait. But in the early evening of Christmas Eve, the wind suddenly changed and they found themselves in the middle of a huge storm that was to last for days. The brothers and crew spent Christmas and Boxing Day in the most terrible conditions, pretty much just trying to keep the vessel afloat. At 2am, on the 27 of December 1935, Maluka and her crew found themselves wrecked on the Victorian coast at Cape Conran. A few locals from Marlo, a town about 20 kilometres from the site, came to help rescue the Maluka. A shed was improvised, and repairs were done using pieces of timber washed down from the Snowy River in a flood. In 1936, after completing the repairs at Marlo, the brothers took Maluka back home to Sydney to prepare her for their second attempt to reach Hobart. This time round, Maluka, the brothers and crew, celebrated their much anticipated Christmas in Hobart. They had taken the route (only 10 years before the first race) that would, from 1945, see hundreds of vessels compete each year as part of the Sydney to Hobart Yacht Race. 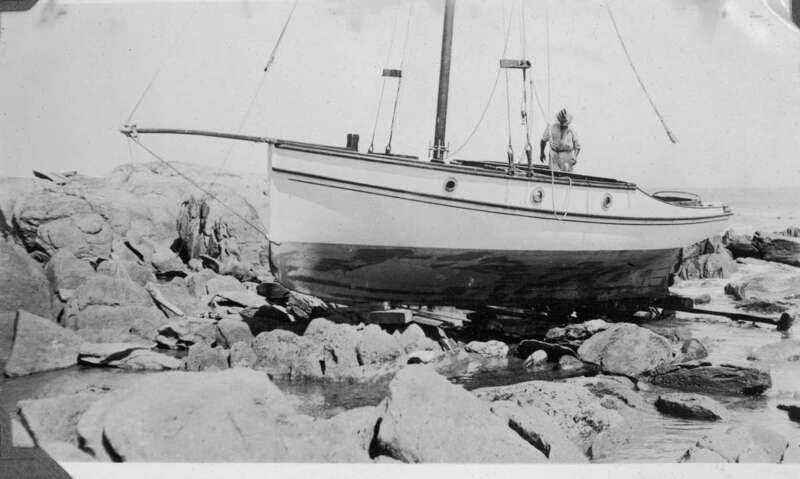 Between 1939, when the brothers sold Maluka, and 2005, she passed around a few hands and was seen doing fishing trips and recreational sailing along the east coast. But in 2006, after a huge restoration under the expertise of Bill Gale (son of the original designer, Cliff) and the enthusiasm of avid skipper Sean Langman, Maluka was seen once more, heading out of Sydney Harbour on her way to Hobart, only this time competing in the fierce Sydney to Hobart race. Despite being 80 years old and the smallest boat in the race, Maluka crossed the finish line in the last position to a rain of cheers and claps of the many revellers at King’s Wharf in Hobart. Sean Langman had followed the steps of the adventurous Clark brothers and showed that a classic wooden cutter still had it in her to cruise along the treacherous southern oceans solely powered by the winds. For more information about Maluka see the museum’s Australian Register of Historic vessels record.